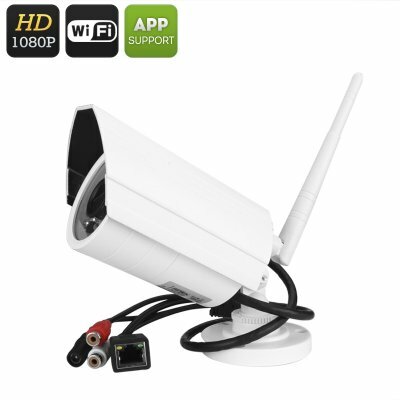 Successfully Added Full HD IP Camera - Wireless, 1/2.5 Inch COMS, SD Storage, Phone Support, Motion Detection, Night Vision to your Shopping Cart. Sporting an impressive 1/2.5 Inch CMOS sensor means that this IP security camera is perfect for high end situations where you need to identify persons or objects passing by its field of view. With full HD footage you can clearly see any identifying features making it ideal for keeping a watchful eye over cash registers, secure locations, storage rooms and other key locations. Motion detection support lets set up your own trigger area, that if entered will trip the cameras alarm systems, not only with this notify you of the intrusion, but it will also make a record of the event so you can see exactly who and when the camera was tripped. With its 1/2.5 inch CMOS sensor, a 3.6mm fixed lens and low lux rating this IP security camera is capable of formidable low light recording and will automatically switch to its best recording mode with IR cut features. Computable with both Windows XP and Windows 7 this IP camera can be reached through all the common web browsers and access from your phone is quick and easy. Just scan the QR code or search and download the P2PWIFICAM software from your app store on you'll have remote access in a few simple taps. Making it easier than ever to keep tabs on your home or business. Wireless network support makes it a simple and hassle free install so you don't need to worry about network cables. just hook this high definition IP camera to your wireless network and you're all set to go. This IP camera comes with a 12 months warranty, brought to you by the leader in electronic devices as well as wholesale wireless IP Cameras and security gadgets..